Becky will be the first to warmly welcome you to our office- either over the phone or in person- with her true southern hospitality. 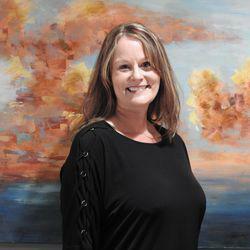 Originally from Abingdon, VA, she began her dental career 20 years ago as a dental assistant, and has previously worked in both general dental and orthodontic offices. She enjoys helping and interacting with patients, and our patients and staff enjoy her bubbly, positive personality and infectious smile. Becky is also our treatment and Invisalign coordinator and will assist you in creating your perfect smile! Becky and her husband love to travel, dine out, and spend time outside in our beautiful weather!